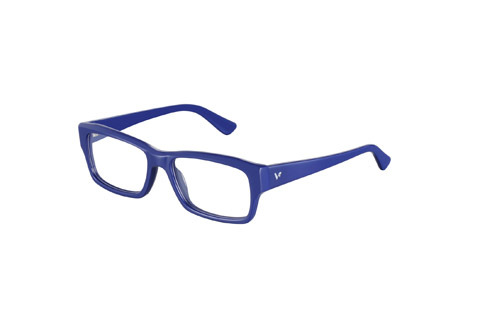 Top From Cherrytree Road Accessories, Macpherson Men’s spring–summer 2012–13 collection and Vogue Eyewear for Men. 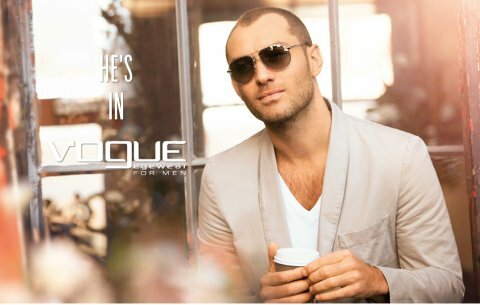 Above Jude Law is the new celebrity ambassador for Vogue Eyewear for Men. Vogue Eyewear has launched a menswear line, with actor Jude Law as its first ambassador, in a campaign shot by Peter Lindbergh. Lindbergh has photographed for Giorgio Armani, Prada, Calvin Klein and Comme des Garçons, as well as portraits of Mick Jagger, Sharon Stone, Madonna, John Travolta, and John Malkovich. A behind-the-scenes video can be found at the official website. 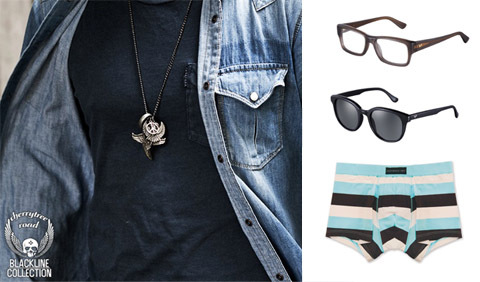 It’s a good season for men: Macpherson Men has a new spring–summer 2012–13 collection of underwear called Hawai‘ian Getaway, inspired by the 1950s. One of the low-rise trunks has a floral print, which shows that the trend that has been present for a few seasons on the womenswear catwalks has made it to men as well. The rugby stripe trunk will suit any man, while a black coffee gingham trunk is made from cotton and elastane for comfort. Macpherson Men’s boxers can be worn around the house or to bed, this time palm-tree or surf prints. There’s also a black tattoo-print slim-fit lounge pant. Not everything is patterned: the classic cotton briefs are available, too. 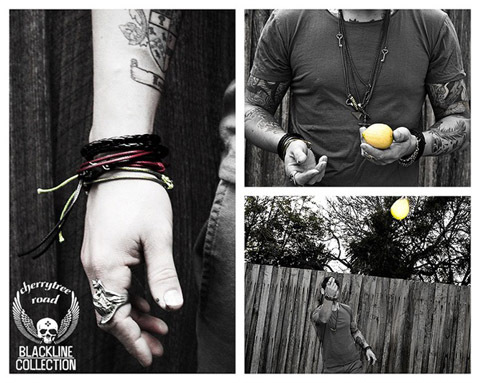 Cherrytree Road Accessories, meanwhile, is showcasing its latest range of fashion-forward jewellery and accessories. Jared Laoumtzis, the creative director of the brand, named it after a street he lived on in a country town called Hursbridge, in Victoria state, Australia. Laoumtzis originally started off doing limited runs, but in four years, his label has grown to stock in 40 stores in Australia, the UK, and now, in New York. He has also created collections for menswear labels Calibre, Jack London, Witchery Man and Autonomy, and gained himself a celebrity following—Cherrytree Road can claim Russell Brand, Ronan Keating, Guy Sebastian, John Myer, Pharrell Williams, Brian McFadden and Ruby Rose as fans. You can become a fan, too, at its Facebook page, www.facebook.com/cherrytreeroad.